Delivery operations are most efficient when dispatchers and drivers work together in perfect sync. At the core of delivery management and collaboration is the need for proper scheduling: dispatchers need to know what drivers and driver types they have available at any given time, even if they’re managing a mix of in-house drivers and third-party fleets. Drivers need to know what work shifts are available to them, and they also need the ability to clearly communicate their availability and secure their upcoming shifts. Dispatchers and management also need to be able to track and manage distances driven, orders completed, and KPIs that are both efficiency oriented (e.g. delivery timing, deliveries per hour) and quality oriented (e.g. customer satisfaction). With the Driver Management module, every element—from streamlined and transparent driver scheduling to performance benchmarks and driver compensation—is digitized, transparent and optimized. The need for drivers to verbally communicate their availability to dispatchers and other managers is cumbersome for all parties involved. With the Delivery Blocks function in the Driver Management module, drivers can clearly communicate when they’re available to deliver, and easily select their desired work times. When drivers are equipped with an integrated tool for managing their delivery shifts, they get a clear understanding of when they’re needed, and driver attendance and retention improves. Delivery Blocks supports both in-house drivers as well as crowdsourced or other third-party drivers, granting each of your drivers the power to effectively and efficiently schedule their working hours. Similarly, the Driver Management module allows flex staff (such as a restaurant’s kitchen staff) who occasionally deliver during peak times the ability to easily “punch-in” as drivers. Bringg makes it easy to keep track of the roles fulfilled by flex staff so it’s simple for management to ensure proper compensation and also keep track of which staff worked in what roles, and when. Employees can use the mobile app to punch in and out between shifts of any type, whether as a driver or in the store, kitchen or warehouse. Alternatively, this can be recorded using an IoT integration such as through a Bluetooth beacon at a delivery bay that automatically records when a driver has left for a delivery and returned from it. The Driver Management module offers dispatchers a centralized dashboard for every element of delivery management: from delivery capacity and driver schedules, to driver performance measurement (e.g. number of miles driven, number of orders delivered), often a primary element of driver compensation. The Bringg platform also offers the ability to record and report tips, which is often required for tax and withholdings. In addition to standard driver distances and orders completed, the Bringg platform also reports on team quality and driver performance. This includes both time-based KPIs (e.g. time to door, and delivery window success rate), and quality KPIs such as customer satisfaction. For dispatchers managing internal or external drivers, or a combination of the two—understanding exactly which drivers they have available at any given time is essential to managing delivery capacity, efficiently scheduling their staff and ensuring smooth delivery operations. The Delivery Blocks function helps ensure more efficient processes, as it aggregates the availability of all drivers into one central dashboard. By centralizing this information, Delivery Blocks makes the task of scheduling easier and more efficient. With the Driver Management module, dispatchers also enjoy a clear understanding of driver’s skills (special capabilities)—such as additional spoken languages, certifications and licenses —are available to deliver at any given time. With this, they can create schedules that fulfill all of their delivery needs. Dispatchers are often challenged with maintaining sufficient capacity during peak delivery periods (e.g. the lunch rush, or holiday delivery season). They’ll often increase the capacity of these delivery blocks to bring in additional drivers, repurpose flex staff as delivery drivers, or extend capacity by contracting an outsourced delivery partner to handle spillover. 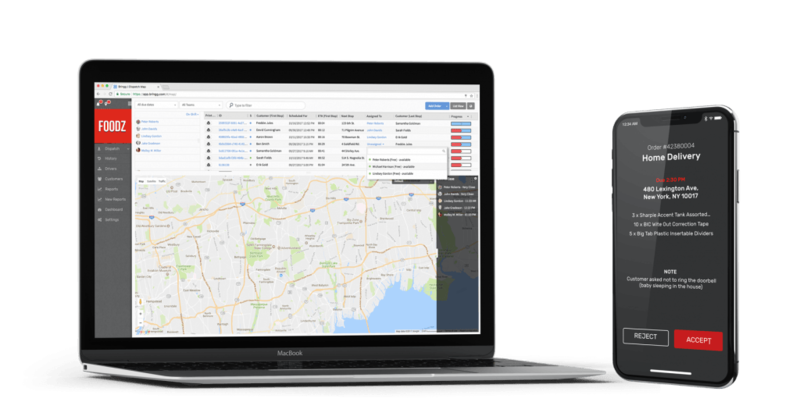 With the Driver Management module, dispatchers can easily manage all of these delivery models via Bringg’s unified, integrated platform. The Driver Management module offers dispatchers a centralized dashboard for every element of delivery management: from delivery capacity and driver schedules, to driver performance measurement (e.g. number of miles driven, number of orders delivered), often a primary element of driver compensation. The Bringg platform also offers the ability to record and report tips, which is often required for tax and withholdings. In addition to standard driver distances and orders completed, the Bringg platform also reports on the quality of team and driver performance. This includes both time-based KPIs (e.g. time to door, and delivery window success rate), and quality KPIs such as customer satisfaction. For dispatchers managing drivers and driver schedules—especially those managing a large number of drivers, or a mix of in-house drivers and third-party fleets—understanding exactly which drivers they have available at any given time is essential to managing delivery capacity, efficiently scheduling their staff and ensuring smooth delivery operations. The Delivery Blocks function helps ensure more efficient processes, as it aggregates the availability of all drivers into one central dashboard. By centralizing this information for dispatchers, Delivery Blocks makes the task of scheduling a mix of driver types easier and more efficient. Customize the Driver Management module to cater to your specific needs, the types of drivers you’re managing, the skills and certifications required, etc. Driver Management makes it easy for drivers to opt into delivery shifts, and for dispatchers to properly manage their drivers’ schedules. Measure driver tasks, tips and performance—both qualitative and quantitative—for driver payments, ratings and internal optimization.